Doha, Qatar – 16 February 2017: The Ministry of Public Health (MoPH) in collaboration with Hamad Medical Corporation (HMC) and the Primary Health Care Corporation (PHCC) has launched its “Start Now” campaign to encourage public awareness of the importance of regular physical activity and exercise as part of a healthy lifestyle. As part of the MoPH’s mission to improve the health and wellbeing of the people of Qatar, the campaign’s first phase 'Start Now…Be Active', calls for a positive change in the daily lives of community members by integrating at least 30 minutes of physical activity into their daily lives. Launched to coincide with National Sports Day that goals to raise awareness of the importance of Sport among the Qatari society, the “Be Active” campaign, aims to engage young people, inspiring them to choose physical activity and healthy lifestyle habits which will help build strong and healthy future generations. The first phase of the “Start Now” campaign focuses on simple, everyday changes you can make to start living a healthier lifestyle, highlighting that it’s easy to include at least 30 minutes of exercise per day. By adopting a healthier lifestyle, including regular exercise, the impact of chronic and lifestyle diseases such as diabetes, heart disease and obesity can be reduced. These small changes include parking your car further away from your destination and using the stairs instead of the elevator. The campaign reminds people that you can also incorporate healthy activities while spending time with family and friends, encouraging people to play with their children, choosing active family activities and encouraging walking, playing sport or going to the gym with friends. “In line with the health sector’s responsibilities, we are always keen to encourage the wellbeing of individuals and maintain a healthy and productive society. Our new awareness campaign seeks to engage the community about the benefits of physical activity, starting with reducing the risk of chronic diseases such as diabetes and high blood pressure, going through weight maintenance, all the way to making sport an integral part of the daily life of the individual”. 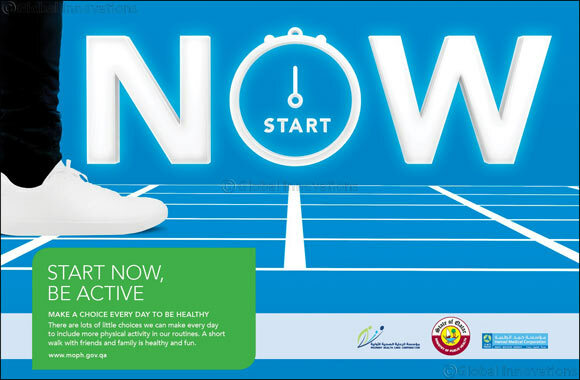 The “Start Now” campaign by the MoPH is aimed at building a healthy future for the population of Qatar, in line with the National Health Strategy and towards the realization of the human development pillar of the Qatar National Vision 2030.